All Teams settings will soon be migrated to the new Microsoft Teams admin center. The only Teams feature that's managed in the Microsoft 365 admin center is Apps. Unless otherwise noted, the default value for an option is On. You can turn off or turn on apps for Teams in Tenant-wide settings in the Microsoft 365 admin center. Apps are tabs, connectors, bots, or any combination of these three, provided by Teams (first-party apps, also known as default apps) or by a third-party (also known as external apps). 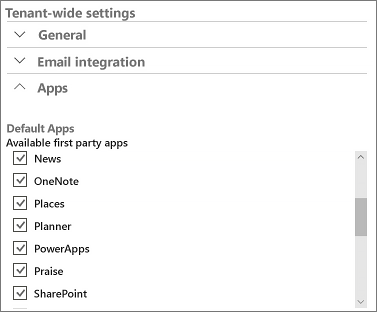 Under Apps, you can enable and disable default apps and configure settings to control external apps. To learn about rolling out apps, bots, connectors, and tabs in Teams, read (Apps, bots, & connectors)[deploy-apps-microsoft-teams-landing-page.md]. These apps, such as Planner, Praise, and Weather, are provided by Teams. To turn on an app, select the check box for that app. To turn off an app, clear the check box. These apps are provided by third parties. You can configure the following settings for external apps. Allow external apps in Microsoft Teams: When this setting is turned on, users can add external apps that are available to your organization. Allow sideloading of external apps: If you want to turn on some external apps and turn off others , turn off this setting, and then in the list of external apps, turn off the apps that you don't want users to access. When this setting is turned on, team owners and members who are granted permission can sideload apps to Teams. Enable new external apps by default: When this setting is turned on, users can activate new apps as soon as they're added to the Teams app catalog. Turn off this setting if you want to control new apps. Of course, if you turn it off, you have to remember to review new apps periodically so your organization doesn't miss out on new apps. To learn more, see Admin settings for apps in Teams. You can control organization-wide user settings in the Microsoft Teams admin center. To edit org-wide settings, go to the Microsoft Teams admin center, and then select Org-wide settings. You can configure the following settings. External access lets your Teams and Skype for Business users communicate with users who are outside of your organization. To configure external access, go to Let your Teams users chat and communicate with users in another Teams organization. In the Add a domain pane, enter the domain name, and click the space bar to save the name. Guest access in Microsoft Teams allows teams in your organization to collaborate with people outside your organization by granting them access to teams and channels. Anyone with a business or consumer email account, such as Outlook, Gmail, or others, can participate as a guest in Teams with full access to team chats, meetings, and files. For more information, see Guest access in Microsoft Teams. In Teams settings, you can set up email integration, cloud storage options, Skype for Business interoperability, and devices. Turn on this feature so users can send email to a channel in Teams, using the channel email address. Users can do this for any channel belonging to a team they own. Users can also send emails to any channel in a team that has adding connectors turned on for team members. To turn on email integration, make sure that Allow users to send emails to a channel email address is On. Here you can turn on or turn off file sharing and cloud file storage options. Users can upload and share files from cloud storage services in Teams channels and chats. Cloud storage options in Teams currently include ShareFile, Dropbox, Box, and Google Drive. Turn on the switch for the cloud storage providers that your organization wants to use. Here you can turn on the Organization tab, which shows the detailed organizational chart for the user’s organization. For more information, see Use the organization tab in Teams. These settings control resource account behavior for Surface Hub devices attending Microsoft Teams meetings. Use these settings to configure authentication requirements, require a content PIN, and turn on Surface Hub resource accounts to send messages. Require a secondary form of authentication to access meeting content – Select the level of access that users have when they enter the content PIN. Set content PIN – Require users to enter this PIN to prevent unauthorized access to documents. This prevents an unauthorized user from joining upcoming meetings and browsing attachments. Resource accounts can send messages – Turn this setting On to allow messages to be sent from the Surface Hub resource account. Switch this setting On to turn on scoped directory searches. You can use these settings to configure how your users will be upgraded from Skype for Business to Microsoft Teams. You can specify a coexistence mode: Teams only, Islands (Teams and Skype for Business will coexist), or Skype for Business only. The Coexistence mode you choose determines the routing of incoming calls and chats and the app that is used by the user to initiate chats and calls or to schedule meetings. For more information about coexistence modes, go to Understand Microsoft Teams and Skype for Business coexistence and interoperability. Here you can choose the app that users will use to join Skype for Business meetings (Skype for Business or the Skype Meetings App). This setting isn't dependent on the coexistence mode setting. How can I tell which features are available? See the Microsoft 365 Roadmap for information about new Teams features. For more information about new and upcoming features, see the Teams What's New page and the Tech Community Microsoft Teams blog for Teams. For information about which roles can perform admin functions, see Use Microsoft Teams admin roles to manage Teams.